Give yourself a mini facial at home with our easy to follow step by step guide and reap the skin care benefits. The products we recommend all use certified organic ingredients and are free from parabens, SLS, synthetic fragrance and other undesirable ingredients. Paying a little extra care to your skin care is a simple way to pamper yourself and eliminating harsh ingredients from your routine often brings comfort and harmony to skin that is stressed, sensitive or out of balance. This mini home facial treatment is perfect to help you wind down after a long day, use slow gentle movements as you apply and inhale gently after each stage of the facial to calm the mind. 1) Prepare a warm basin of water; two drops of Lavender essential oil or Dr Hauschka lavender bath gives a wonderful fragrance and helps hard water feel gentler on the skin. 2) Warm face with flannel or muslin cloth; when face is warm apply cleanser in upward circular movements, then remove with the warm cloth for a mild exfoliation. 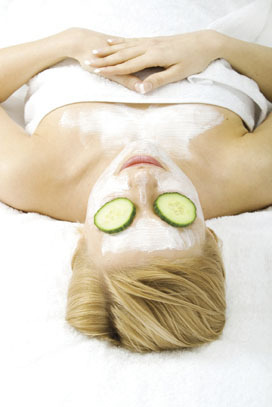 3) Apply your favourite mask, and relax for a few minutes while it does its work. 4) Remove with a fresh muslin cloth and warm water. 5) Apply facial toner; either spray on the whole face or apply to cotton wool pads for deep hydration. 6) Make sure skin is dry; apply an appropriate moisturiser in upwards smoothing movements, avoiding the eyes. 7) Tapping your eye cream on gently relieves puffiness and swelling, ensure you do not put too close to the eye, on the bone is perfect. 8) Take a couple of minutes to massage in your facial oil. Oils are deeply nourishing and give the skin a real glow. 9) Finally relax wile you sip a warm cup of organic herbal tea, (we like organic hibiscus which is packed with antioxidants to boost skin function), before getting an early night and topping up on your beauty sleep. If you have any questions or need help choosing the products that would be right for your skin we are here to help. Take our online skin consultation to help you discover your skin type and email or call us on 020 8465 5600 for one to one advice.